Manco .NET Licensing System provides many different ways to license.NET products. The most popular way is licensing by secure encrypted “Unlock Key”. 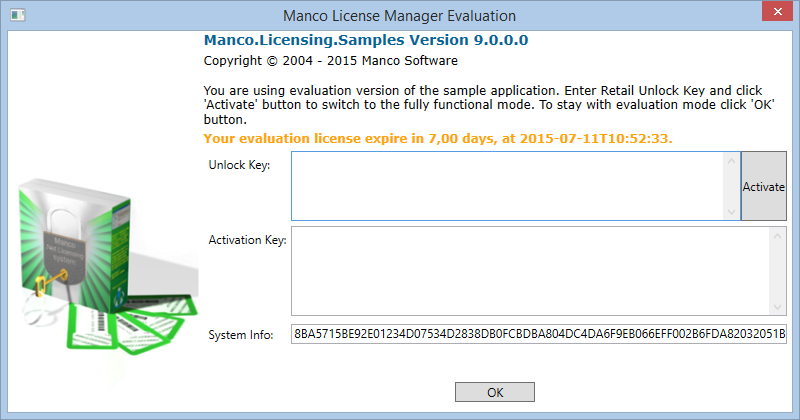 Manco .NET Licensing System uses a public key encryption to generate and verify encrypted license keys. This schema is more suitable for licensing .NET applications, but you can use it to license .NET controls as well. The "Unlock Key" licensing schema for the copy-protected application works as following: when customer downloads your application from the Internet he or she gets an evaluation version. It will start out in evaluation mode, limited by the number of days the customer can run it. When the customer buys your application, he or she will receive an "Unlock Key", enter it into the application, and get not limited, fully functional application. The software protection library uses rules from the license type as work instruction. 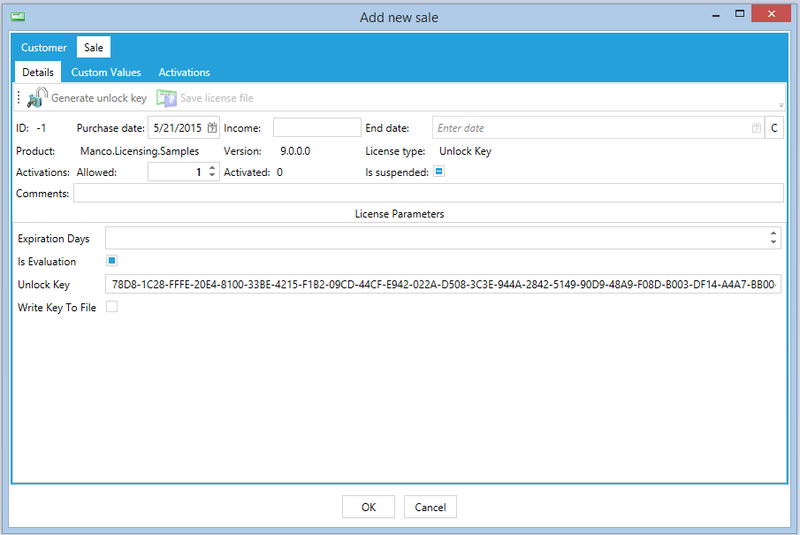 Let see how "Unlock Key" licensing schema works in Manco .NET Licensing System. The evaluation status of the application is defined by including “Is Evaluation” rule to the license type. 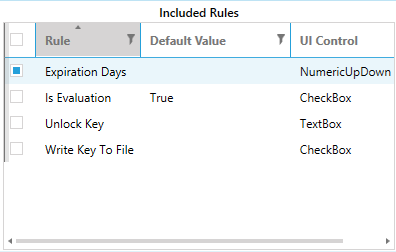 Length of the evaluation period is defined by including one of the following “Expiration Dates”, “Expiration Date” or “Expiration Runs” rules to the license type. The “Unlock Key” rule should be included to the license type to force protection library verify Unlock Key. The “Write Key to File” rule should be included to force protection library save entered “Unlock Key” to the protected license storage. If “Is Evaluation” rule is included to the License type, the license will be valid (evaluation license is valid license) but have evaluation status. Evaluation status of the license can be checked using corresponding property of license object. This status can be used to limit functionality of the application in evaluation mode. If one of the time\running limit fields has been included to the license type, then application will work till expiration come. Depends on the settings license object can throw exception or set expired status on license. You can check expiration status of license using corrsponding property of the license object. If Unlock Key has been entered and it is valid, then evaluation and expiration statuses will be removed and license become valid. If wrong unlock key has been entered license become invalid. Invalid (wrong unlock key has been entered). Valid (valid unlock key entered). Using License Manager you can create single Unlock Key withing purchase or create a bundle of Unlock Keys (to send them to separate distributor, for example). You can use Unlock Key licensing schema as it is or in conjunction with “Activation Key” method so that licenses can be used only on one machine at a time.